"O God of Clotilde, help me in this my hour of need. If thou wilt give me victory now, I will believe in thee." Clovis, Battle of Tolbiac against the Alemanni"
Clovis (aka: Chlodowig) was the king of the Franks and drove the Romans from all of Gaul and subdued other tribes. He married Clotilde, a Catholic woman, who sought his convesion. Finally, after calling on God's aid in the battle against the Alemanni and realizinig his plea, he confessed Christ as Savior and embraced the catholic faith (as opposed to the Arian heresy that was prevelant in the land.) 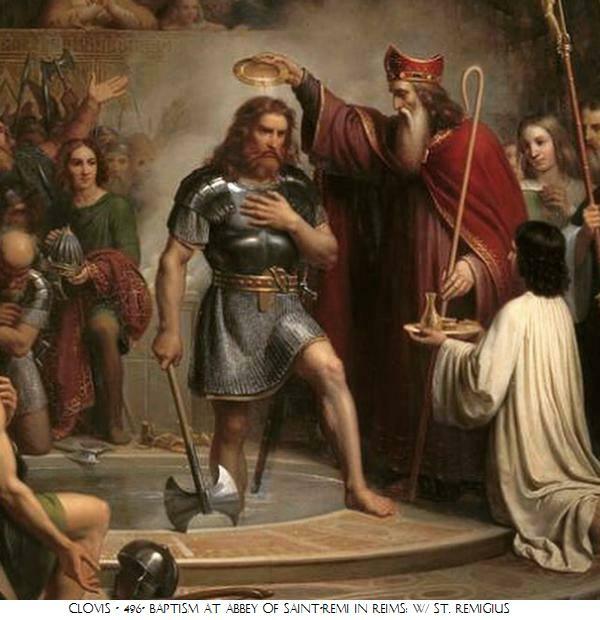 He was baptized at Rheims on Christmas Day by Remigius, the bishop, along with many of his warriors. He instituted Roman Law and Church reform. He passed this life on 28 November 511AD.